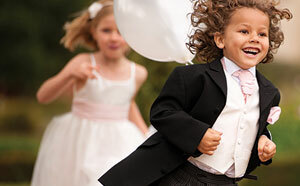 Suit hire for kids is becoming more and more popular as children are featuring more prominently at certain events. Kids play a central role at christenings and bar mitzvahs and are a key part of many wedding ceremonies with the duties of page boys and ushers. One thing that is for definite - whatever the occasion is that you want your child to look the part, suit hire makes this possible. There are many benefits to suit hire for kids over the option of buying a suit; the biggest positive is the fact that hiring allows you to find a suit in any style for any occasion that is a perfect fit. Buying a suit means going of generic sizes and hoping that the suit looks ok, hiring will give you the opportunity to have your child properly measured and a suit provided matching those measurements. Like adult suits, kid’s suit hire can be done from a shop on the high street or from an online retailer; both options have benefits. Hiring from a shop is the traditional method of hire and still the most common, this should be the preferred method if you wish to have a suit tailored to the exact measurements of the child. Hire shops will also give you the chance to see how suits look first hand and see which colours and fabrics look best. However, not all hire shops provide children’s suits in all sizes, and you will need to be prepared to shop around to find a suitable outfit. This can prove time consuming, especially if you are journeying via public transport. Shopping around is best done online. Online suit hire is excellent for convenience, and you will have access to hundreds of hire companies in one place. Internet retailers are able to offer the same suits found in shops with the added benefit of being able to order and have the outfit delivered without leaving the home. Online hire stores will not give you the option of a made to measure suit or the chance to try on before you order, but you are able to order suits in advance and then return them for an alternative if they are unsuitable. An extra benefit of the internet is the fact that most of the high street hire shops now have websites promoting their stock; this will allow you to find a suit at a shop in your area and reserve a suit for your child. Kids and suits are not the best combination and by putting this type of outfit on your child you run the risk of something being damaged in some way through spilt drinks or food or playing and rolling around. As a solution to this problem, many companies offer kids suit hire with optional insurance to cover accidental damage, this is generally charged at around £5.00 per suit and can be beneficial for peace of mind if nothing else.